Model affected: GPE053(A,B) with an output of 5 or 7.5 volts DC supplied from Sonova Australia Pty Ltd for Phonak or Unitron products via hearing care professionals and registered hearing equipment distributors in the hearing industry only between 1st October 2011 and 31st July 2014. There is a risk of the adaptor faceplate being dislodged resulting in the internal components being exposed. 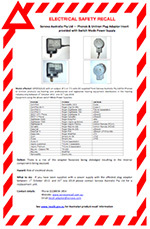 If you have been supplied with a power supply with the affected plug adaptor between 1st October 2011 and 31st July 2014 please use the Apply for Replacement Unit Form below or contact Sonova Australia Pty Ltd for a replacement unit.